In today's fragmented age, influence can come from almost anywhere. Whereas in the past fashion and style trends seemed to be passed down from on high, today technology allows almost anyone with a smartphone and a keen eye to become an instant influencer. From bloggers to Instagrammers to YouTube stars and brands, everyone has a voice and the ability to share their favorite brands, products, and stylish looks to become a fashion influencer for millions. 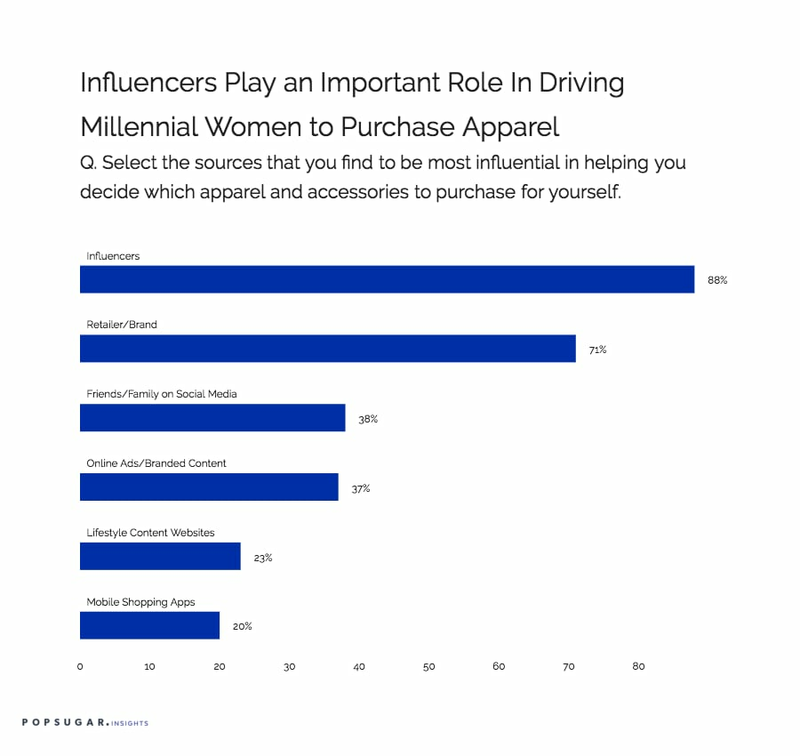 As part of the POPSUGAR Future of Retail Experiences study, we wanted to explore the sources of fashion and style expertise that resonate best with millennial women, especially as they consider which apparel and accessories to purchase. We asked them to tell us which sources they find to be most influential at driving purchase behaviors. Overall, influencers live up to their name, with 88% of millennial women saying that they are spurred to purchase apparel and accessories based on an influencer recommendation. Influencers are a broad term and in our definition comprises celebrities (36%), topic experts (28%), and bloggers/Instagrammers/YouTube experts (24%). Both collectively and individually, these influencer segments are more influential for millennial women than for women 18 to 49. For example, bloggers/Instagrammers/YouTube experts are 26% more influential for millennial women, and topic experts are 21% more influential among millennial women. After individual influencers, millennial women are influenced to purchase apparel by individual retailers or apparel brands, either via the brand's website (37%) or social media channels (34%). Perhaps not surprisingly, a retail brand's social media channel is 40% more likely to be influential among millennial women than women between the ages of 18 and 49. Interestingly, the influence of friends and family (38%) is nearly equal to the influence of online ads and branded content (37%), perhaps showing the importance of branded content and the evolution of traditional digital display ads moving to native formats is growing as brands continue to invest in these channels and become more sophisticated in offering millennial women expertise, providing entertainment, and giving inspiration to apparel shoppers.